The California Phenology Project, a partner of USA-NPN, was initiated in 2010 to study the effects of climatic variation on the timing of life cycle events in California flora. Volunteers and staff at 7 National Parks used Nature’s Notebook to collect data. The authors compared observations of leaf budburst, flowering, fruiting and leaf drop with climate variables such as temperature and rainfall. 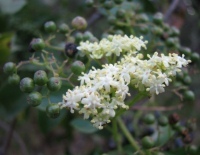 Species studied included four widespread, locally and ecologically important species: coyotebrush, valley oak, elderberry, and California buckwheat. The authors were able to detect differences in phenology for the four plant species studied across California. The authors found that in all four species, at least one phenophase responded to higher winter low temperatures with delayed onset. Generally, precipitation strongly influenced leaf phenology, while both precipitation and temperature were important for flower and fruit phenology. This study used Nature’s Notebook protocols, which involve monitoring the same individual plants over time. This method allowed the authors to know than any difference in the timing of onset for a particular plant from year to year was due to environmental variation rather than genetic variation. This study is one of the first of its kind from a water-limited system. Plants in these water-limited systems behave differently than temperate deciduous plants. The wide geographic sampling across California enabled the authors to distinguish the effects of minimum monthly temperature and cumulative monthly precipitation on onset dates. This study gives an increased understanding of how the previous winter’s temperature and rainfall affects leafing, flowering, and fruiting for these species. We can now better predict how these species will respond to future warming and intensifying drought. This study highlights the importance of Nature’s Notebook data – twice weekly monitoring was enough to detect the phenological differences associated with climate among species, sites and years. This study also demonstrates the utility of data collected by trained volunteers. Citation: Mazer, S.J., Gerst, K.L., Matthews, E.R., and Evenden, A. 2015 Species-specific phenological responses to winter temperature and precipitation in a water-limited ecosystem. Ecosphere.